I was going through some photos on Facebook and found something that is Oppo worthy. A couple of months ago, My father and I embarked on a trip to the Nurburgring for a private event with Sabine Schmitz (which will happen again this september). I am not sure if I have many pictures. I do have this though. This is Ms Schmitz's dog. Anyhoo, on the way, we stopped off at a hotel in Amiens. Nothing overly exciting about the hotel, although the sheets were relatively comfortable and light. 9 out of 10. Would recommend. 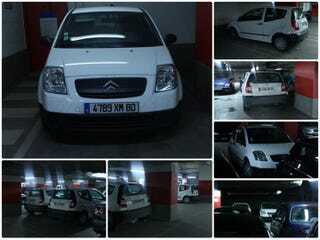 One thing that confuses me to this day is the 19 Citroen C2's parked underground. They didn't seem to be rentals or work vehicles upon inspection but then again , I was far too tired to care. What's even creepier is that the next morning they were all gone, leaving no trace of existence behind.